Tie the knot in Eureka Springs…”The Wedding Capital of the South.” This Ozark Mountain town is recognized by America in Bloom, The National Trust for Historic Preservation and American Style Magazine as one of the most beautiful and well-preserved places in America. What will make your wedding unforgettable… An American Architectural Icon? A Majestic 19th Century Castle? A lush Victorian Garden? Eureka Springs has these and many other unique wedding sites. Imagine your wedding in the world renowned Thorncrown Chapel, the 1886 Crescent Hotel, or at one of several unique Victorian Bed and Breakfasts that dot this mountain town. 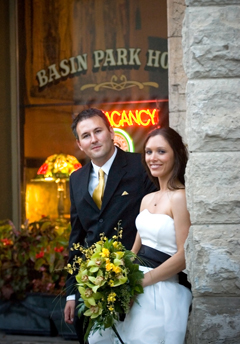 Whether you are planning a destination wedding or a classic wedding on a budget, Eureka Springs has the perfect site. Faire la Fête Rehearsal Dinner– Toasts and laughter accentuate fresh food and warm ambiance of The Grand Taverne. French trained Chef Dave Gilderson’s creations begin with his balcony herb garden. Fresh made bread and gourmet specialized coffee accentuate unforgettable French American cuisine with World Class presentation. A Dream Wedding– you have dreamed of this day and your castle and carriage is waiting. Say your vows on The East Lawn of the 1886 Crescent Hotel surrounded by formal Victorian gardens. A daytime reception in The Conservatory is highlighted with glorious natural light. An evening reception is magical under the subdued lighting of crystal chandeliers in the award winning Crystal Dining Room. A Gallery Wedding-We borrowed this idea from The Knot. Gallery weddings are trending and Eureka Springs has a vibrant working artist community and an amazing number of top notch art galleries. Perfect for smaller ceremonies and for art lovers, an art gallery wedding is a creative way to incorporate the tastes and passions of the couple. Consider the gallery inside The Queen Anne Mansion for an intimate ceremony or reception. Honeymoon Road Trip– what better way to learn about each other than on a road trip? Drive through the scenic roads of the Ozark Mountains. Stop to take photos on the “Little Golden Gate Bridge”, one of the most picturesque bridges in America. Travel over the river and through the woods to Eureka Springs to begin your Extraordinary Escape. Eureka Springs is like no other place on earth. Recognized as a Top 25 Arts Destination by American Style Magazine, Eureka Springs’ creative community includes wedding photographers, wedding flower designers, hairstylists, makeup artists and other wedding professionals. 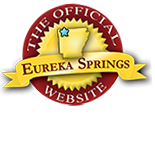 Explore EurekaSprings.com to locate wedding professionals for your wedding cake, flowers, photos, videos, spa, salon, entertainment, apparel, transportation and more. For unique wedding gifts, plan on registering for local art at some of the unique shops in Eureka. This entry was posted on July 8, 2011 by estcblog in Basin Park Hotel, Crescent Hotel, Wedding Capital of the South and tagged America's Most Haunted Hotel, Arkansas, art galleries, culinary, gardens, weddings.